This is our signature cruise! 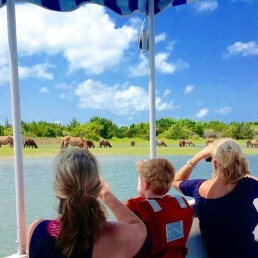 You’ll enjoy a narrated wild horse, nature and history cruise from the historic Beaufort, North Carolina waterfront. 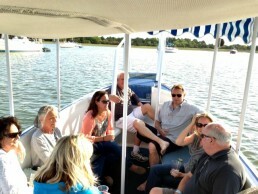 Daily 45-60 minute shaded cruise of the calm waters of Beaufort, Taylor’s Creek and the Rachel Carson Reserve. There are eight (8) trips a day (in-season). Your professional and personable Captain not only safely navigates the vessel, but also guides you along the way, answering any questions you might have and making sure your group is comfortable and welcomed. This is a personalized tour, not a scripted loudspeaker experience. Departs every hour from 10:15 a.m. to 5:15 p.m.
10:15 a.m., 11:15 a.m., 12:15 p.m., 1:15 p.m., 2:15 p.m., 3:15 p.m., 4:15 p.m., 5:15 p.m.
Departs every hour from 11:15 a.m. to 5:15 p.m.
11:15 a.m., 12:15 p.m., 1:15 p.m., 2:15 p.m., 3:15 p.m., 4:15 p.m., 5:15 p.m.
*All tour departures are based on a minimum number of persons. 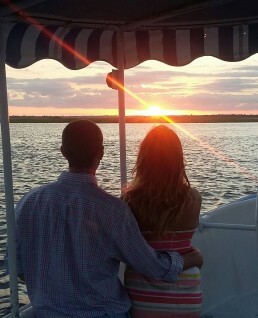 Interested in a sunset cruise? 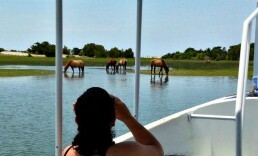 Waterbug Tours gives you a double deal by taking you on our signature Wild Horse, Nature & History Cruise, but during what we call the “Golden Hour”. Beaufort’s Taylors Creek is home to some of the most spectacular sunsets on the Crystal Coast of North Carolina! It’s an amazing experience right here on Beaufort’s waterfront. Definitely, plan to bring a camera! You are welcome to bring a cooler with your beverages of choice! Cruise departs one hour prior to sunset. Give us a call to receive the departure time for tonight! Private cruises can be reserved by buying out all 16 seats @ $22 each. We recommend that you consider bringing sunglasses, a camera, binoculars, a sense of adventure and of course a love of nature. We do offer Private Charters for a variety of events! Please visit our private charter page for more information. Or you can contact us to start planning your event with Water Bug Tours!